Wax Hands is a fun attraction at the National Wax Museum Plus. Located in the gift shop , Wax Hands give visitors a chance to have a copy of their own hand molded in Wax to take home & keep. The Wax Master machine consists of 2 basins of cold water, a large pot of hot silicone Wax and 6 small pots of hot coloured wax. Essentially it is a dipping process where the visitor firstly selects the hands pose they desire, then dips the hand into cold water. This is followed by a dip into the hot wax After which a staff member wipes of the excess wax. This process is repeated 4 times. Next an air pocket is created between the hand and the Wax, allowing it to be slipped off, giving a cast of the hand. Its as simple as that ! This one of the most exciting things to do at the end of your tour! Is the Wax very hot ? The Wax is quite hot to begin with. It is like getting into a hot bath, but once the first layer of wax is on, it provides a protective layer, making your hand not feel as hot. Keep in mind you must keep your hand very still throughout the process. 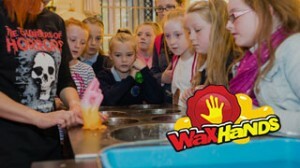 What age do kids have to be to get a wax hand done ? Kids must be 5 years old or over to have their wax hand done. Follow The National Wax Museum Plus’s board Wax Hands on Pinterest.